Among family offices leading direct investments, we see the high fixed costs of in-house expertise become cost-efficient when allocations grow north of $100M, lending the intuition we call 'The $100 Million-Dollar Rule of Thumb.' Families want an advantage over market-rate investment management fees, and to capture that spread, scale is required. The turbulence of public markets pushes family offices to deepen their portfolios in the private markets, where risk-adjusted returns are higher and volatility is lower. Diversifying into alternatives provides a non-correlated buffer against public exposures and a welcome respite from tracking the daily ticker. In private equity, some families look to up the ante, skipping fund structures and rolling up their sleeves to execute their own 'direct investments' — deploying capital directly into operating companies. The draws of deal-direct plays are justifiable: more transparency, greater control, lower fees, higher potential upside. Execution, on the other hand, can be a different story. At Nextvest, we work daily at the intersection of dealmakers and co-investors, meeting hundreds of family offices and witnessing deal activity on both sides of the table. From the the multi-billion dollar family with forty direct investment professionals across the globe to the family struggling to close a deal every other year, we see a wide range of operations. Among the trends, we notice small direct investment teams often cannot close enough deals to justify their cost, and understandably so. Most families never dedicate enough internal resources to build a baseline level of capabilities. Building a cycle of dealflow is difficult, even for veteran teams. To be successful, a group must: 1) source a robust pipeline of deals against a competitive marketplace, 2) be capable of diligence with top-tier analysis, 3) possess industry and sector expertise, 4) have familiarity executing similar deals, and 5) move quickly. To execute direct investments efficiently in the private markets, a serious commitment of resources to the strategy is required. Or, by the numbers, it isn't worth doing. Entering the high-stakes game of direct deals means bringing a significant cost center in-house — a heavy-hitting investment team of top-tier professionals (3–4 full-time staff). The expertise on staff must be able to perform at every stage of the deal process, from sourcing and vetting to acquiring, managing, and, eventually, selling. Direct investing means running a deal factory and a gap in talent at any stage means stalling the bottom line with fear and indecision. A bare-bones direct investment team typically includes a partner, VP, analyst or associate, and a dedicated origination manager. The fixed cost of keeping these pros in your living room starts rolling at a conservative $2.1M per year (an annual salary sum of ~$1.4M, with T&E, benefits, and office space rounding out to about $2.1M). Shy of paying them in kindness or charging for coffee, the bill can't be trimmed much tighter than that. To understand how these costs weigh at scale, we must fill in the rest of the picture as a higher upside comes to play. Running your own in-house investment team does allow capturing more of the upside, as the variable cost of carried interest promised to an internal team is naturally well below the traditional PE fund standard of 20%, landing closer to 15%. Modeling the efficiency of a dollar in a steady-state portfolio (after an initial 7–10 years when regular harvesting is achieved) at various allocations from $10M to $125M, we can see the total cost as a percent of the initial capital allocation drop precipitously from 24% with a $10M allocation to 7.2% with $50M and down to 5.1% with $100M. 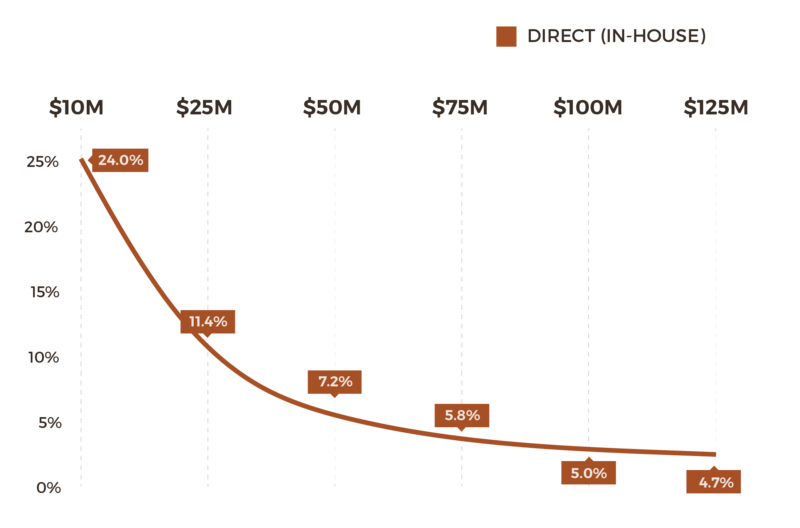 So where along this efficiency curve would an in-house team beat market-rate fees? We consider the other options for market-rate comparisons: invest in a fund or develop trusted partner relationships and co-invest. Funds are the baseline strategy for PE allocation and the natural starting point for any family office. The standard "two and twenty" fee structure on a fund is a 2% annual management fee and 20% carried interest. The workload on the family office is kept to a minimum as the burden to source, diligence, operate, and exit the deals falls to the fund. Families must only vet the fund managers, commit capital, and then periodically check in — requiring only a fraction of a senior player's time. At any family office, at least a CIO is already on payroll, so we attribute $100K of existing partner-level capacity to the fixed costs of a fund strategy. Because the bulk of support costs are spread pro-rata to participants via management fees, smaller players benefit from the cost-structure of funds. 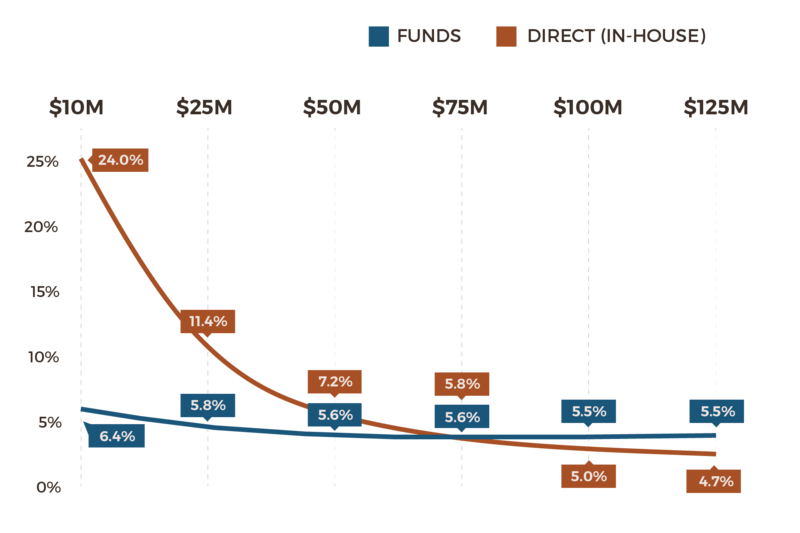 We see the cost-efficiency tradeoff occur against direct investing around a $75M allocation, indicating players below that threshold are better off using funds and those above, leading direct investments. Between insourcing with your own team and outsourcing to funds lies the middle ground of co-investing. Co-investing is a form of direct investing, through which families take a stake directly in a company, investing alongside a lead family or professional sponsor. Co-investments afford families the privilege of transparency, to know the target companies before investing, but the minority status leaves the control (and overhead) of operating the investments to the principal. To staff for co-investing, family offices need trusted partnerships and to maintain internal diligence review capabilities, taking an estimated $200K fractional share of partner-level time in fixed costs. 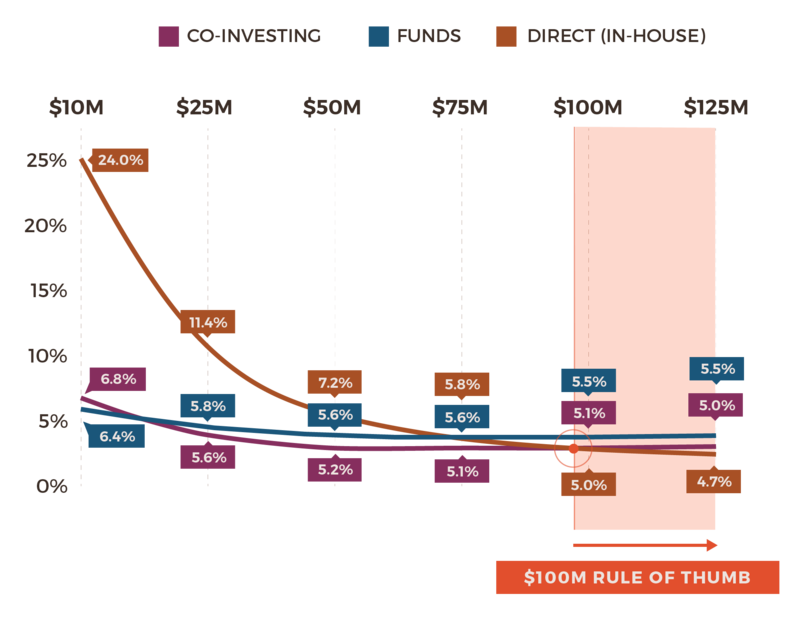 Layering the cost efficiency of co-investing against leading direct investments and funds, we see co-investing emerge as the most cost-efficient approach for allocations in the range of $15M to $100M. Below $15M in PE allocation, a fund strategy wins out. Above $100M in direct PE, running an in-house arm realizes cost advantages over fund investing and co-investing (remember, that is only after the portfolio achieves a steady state, often requiring a decade or more to reach), coining 'The $100 Million-Dollar Rule of Thumb.' With most families allocating approximately 20% to PE, an implied minimum of $500M AUM is required to float an in-house structure. The operations scale up with growing efficiency, but scale down perilously. Below $100M in direct PE, staff costs become too expensive and fail to achieve desired cost savings. For smaller families unable to dedicate the resources, or for larger families unwilling to, the overhead necessary to principal one or two direct investments each year is simply not practical. Sensibility begs other approaches.